Australian publisher eBook Dynasty recently launched a web-based survey on global Chinese-language reading trends. If you know anyone who reads Chinese – Simplified Chinese or Traditional Chinese or both – please encourage them to participate. The survey aims to understand how Chinese-language readers discover, purchase, consume and share the books they love. While reading formats do and will always matter, the survey specifically focuses on how these readers interact with each other in the Chinese social and cultural context. Also under the spotlight is what these readers expect from authors in Chinese or English or both languages. It should be noted here that the Chinese language has two written systems – Simplified Chinese and Traditional Chinese. Hence, by “Global Chinese-Language Reading Trends”, the survey explores the reading tastes and behaviours of Chinese-language readers not only in China, Taiwan, Hong Kong and Macau, but also in other Chinese communities across the world. As a thank-you to all participants, eBook Dynasty offers eight (8) Chinese ebooks for free. Each participant can choose one (1) title and then receive it at the email address they have provided. These eight Chinese ebooks cover a diverse range of fiction and non-fiction genres, such as poetry, short stories, young adult fiction, erotica, literary criticism, science fiction, illustrated science fiction, and professional guidebook (in this case, digital forensics). If none of these titles suits their reading tastes, survey participants can receive a twenty-percent (20%) discount when they purchase one of the many other Chinese ebooks currently for sale on eBook Dynasty’s online bookstore. Needless to say, how participants choose their titles at the end of this survey will offer a glimpse of the general preferences of contemporary Chinese-language readers. The survey will conclude on December 31, 2018, with results collated, analysed and announced in early 2019. These results are expected to be of considerable value to emerging and established authors, literary agents and publishers across the world who are interested in engaging the Chinese-language reading market. 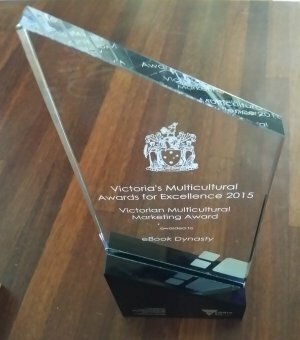 * The “Global Chinese-Language Reading Trends” Web Survey is sponsored by eBook Dynasty (@eBookDynasty), a Melbourne-based Australian publisher of Chinese-language digital and print books. We assist emerging and established English-language authors, literary agents and publishers translate, publish and promote their titles as digital and print books in Chinese language, while helping Chinese-language writers promote their writings to the English World. In 2018, eBook Dynasty is a participant of Foundry658 Accelerator, an intensive business program offered by the State Library Victoria and the Australian Centre for the Moving Image (ACMI) as part of the Victorian Government’s Creative State strategy. We hereby acknowledge the inspiration and support offered by organisers and fellow participants of this valuable program.